The Entirety of Suffering in 14 Words – Love. Life. Practice. Yesterday while doing some studying with Middle Daughter I was trying to adjust some electronics into what I had hoped would be my Road Warrior Writer’s kit. 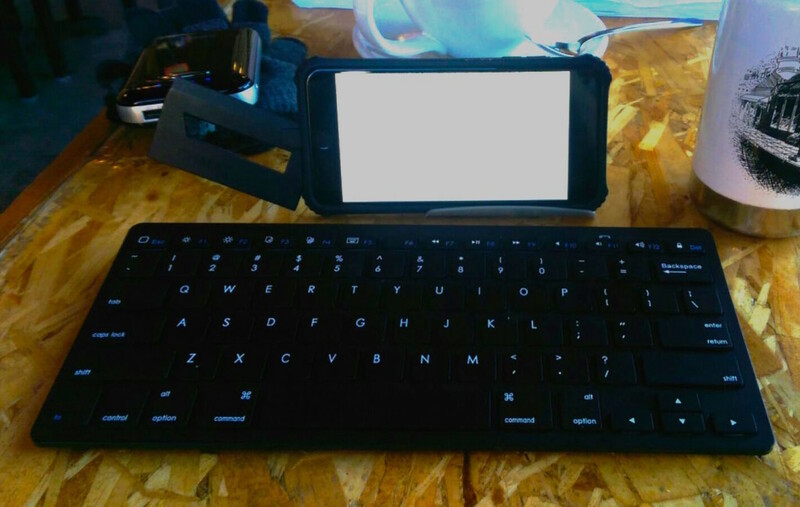 It consisted of an Anker portable battery which was charging my iPhone 6+ (in a very low-tech stand hack) via the Nomad ChargeCard while I typed using Daedalus on a full-size Anker keyboard. Indeed it is. Simply an illustration of the Buddhist proverb: The sum total of your suffering is the difference between the way your life is and the way you want it to be. Of course, it’s possible to change either of those factors and become happier. But the question is, which do you really have more control over? Eventually – through things like journaling, meditation, and other self-awareness exercises – I think people who do it long enough eventually discover that it’s easier to control one’s own mindset than to control the rest of the world. Not easy, mind you (ha!) – but easier. Or, to put it another way, the old saw of “Think globally, act locally” may be a lot more “local” than we realized. Speaking of globally, there are now two ways to support Love Life Practice! One is the usual Patreon site where you can become a monthly patron. You can also make a one-time donation through http://cash.me/$graymiller .